Are you like me and feel that your home or settlement is lifeless without clutter? 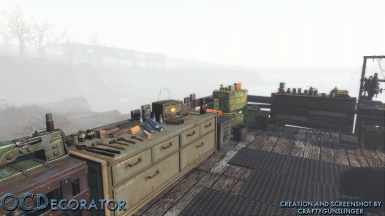 OCDecorator allows you to lock movable objects in place, using the in-game settlement builder! That's right, those items you have been collecting can now be placed as static objects and nothing will ever knock them over. 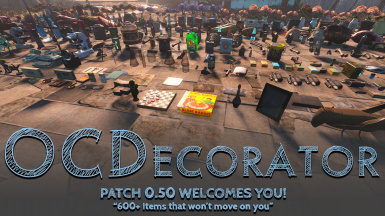 Decorators and Builders Rejoice! Gorshkov's Egret Tours Marina optional. If you dont have it, nothing bad will happen. at all. HELL ... a Vault 88 Blueprint bones, bones and more bones! Vault 88 Proper Vault Exits Blueprint Optional! While this Blueprint is not as lived in as some other high quality BP's out there I uses OCDecerator here and there to add some static items. 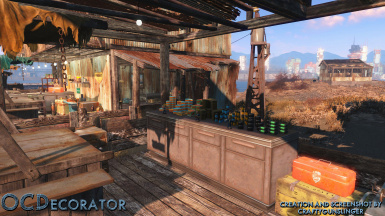 Wasteland Outpost - Abernathy Farm blueprint Choose the combined Far Harbor and Nuka World option. 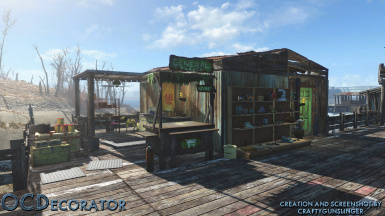 Wasteland Outpost - Tenpines Bluff blueprint Choose the combined Far Harbor and Nuka World option. I pretty much consider this mod a community resource. If someone wants to make a spin-off and try something new, that's fine. Mcface has been gone for a long time, and the rest have been members of the community that have stepped in to keep it going. I would ask 2 things. The first is that you consider putting a link to this mod if you make your own better version, to give credit to the work mcface and everyone put into it. The second is that you don't copy the name of the mod for your own. Fixed misc FOMOD text errors. Not a required update if you've got everything installed correctly. Added descriptions in the FOMOD. Fixed a wrong FOMOD path. 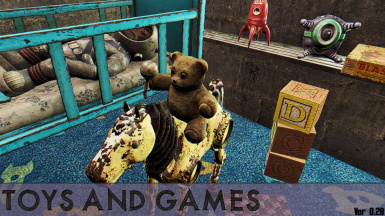 Added Nuka World DLC add-on. Added support for Vault Tech and Nuka-World. Use with 1.6.3 or greater. Added a single OCDecorator.esp for the Wasteland version, saves a esp spot and makes it easier for SKE users to patch the mod correctly. Cleaned about 8 files with <error refs> that were disrupting functionality. Removed one duplicated crafting record that got in somehow. I appreciate everyone's feedback and friendliness while they used the 1.05 release. It was a big change that didn't work completely as people wanted, so it helped me make the decision to bring back the full OCDecorator menus. Now we can have best of both worlds. OCDispensers crazy magic powers of spitting out static objects, plus the ease of use of the crafting menus. 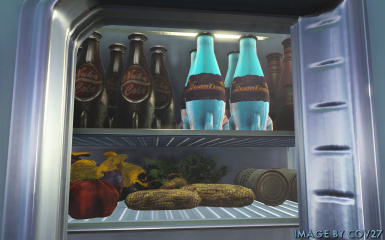 • Empty Nuka Bottle suffers from the same missing glass icon bug as other glass items. • These are all "Replicas" and cost normal materials. Not the item itself. 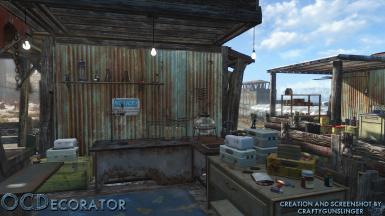 • Added Mortar Round and LIBERTY PRIME BOMB! • Added 3 missing Cans (Can, Tin, Aluminum) to "Kitchenware & Supplies"
• Added alternate version of the clothing hanger, per request. • Added standing/leaning versions of Walking Cane and Pool Cue. • Added Stealth Boy to Tech. No idea how I missed this. Thanks Darwina for pointing this out. • Added 120 Magazines to "Books & News" Category. • They are "Replicas" of the real magazines because of current limitations. • Currently Costs Cloth and Adhesive. • Fixed Components for Components to be proper Components. • Swapped the models of the two typewriters. • Updated the Icons for the Workbench and Chems & Meds Categories. • Fixed the missing property of 12 objects that was preventing the placement on anything other than the ground. • Changed the snapping of the Clothes Hanger to be horizontal, rather than vertical. • Fixed the snapping of another big chunk of items. There might be some I missed but I believe I have all to most. • Merged Kitchen and Dining Room categories into "Kitchen & Dining"
• Fixed the cost of Bobby Pin Box to 5 Bobby Pins. • Added the three missing "Robot Parts" models. FINALLY! • For now the Cue Stick will cost wood to create. I need to figure out how I'm going to deal with weapons. • For now the Walking Cane will cost wood to create. I need to figure out how I'm going to deal with weapons. • Added very cool box full of spare parts to..well..the spare parts and components category. • For now the Boxing Glove will cost cloth to create. I need to figure out how I'm going to deal with weapons. 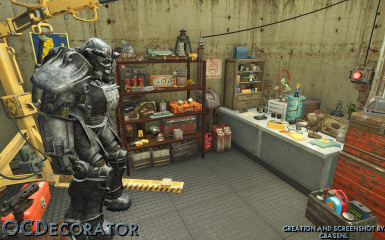 • Added 27 Items to new Tech category, Mostly BoS and Institute Items. • Added Life Preserver and Fishing Pole to Sports & Fitness, for now. • Bug Fix: Mysterious Serum NOW requires you to have finished that quest, for it to show up on the menu and it costs a stimpak to place. It will not be removed from your inventory. Prior to fix, removing the Serum and Scrapping it was resulting in an inability to get a replacement serum from Lorenzo. 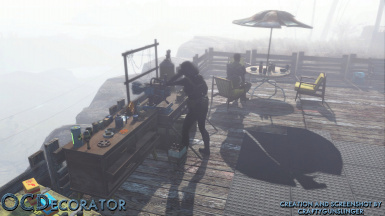 • This is to help relieve some of the issues in the crafting menu. • No items will be removed. • Fixed the snapping on 24 grown food items! Thanks GhostBustThat! • Fixed snapping on Shovel, Hoe, Mini-Nuke, Missile and a few others - Thank again, GhostBustThat for doing some of these fixes! • Merged Plates, Drinking Glasses and Bowls into a Dinnerware Category. 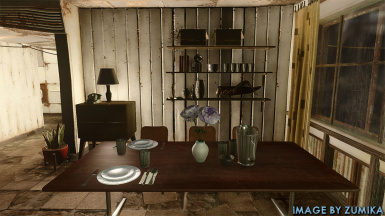 • Merged Dining Room Misc into Utensils. It's now Utensils & Misc. • Reworked the household category. It is more compact and is now labeled "Household and Personal Effects." • Removed "Bones" Category and placed it directly into "Body Parts"
• Added "Alternate" Sideways laying Cig Packages and Cartons. - For lolcat! 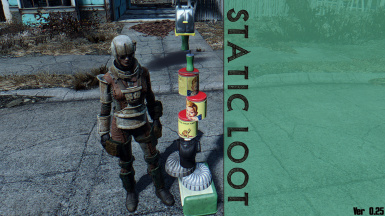 You can place ANY lootable object as a static object, using a custom container (OCDispenser). 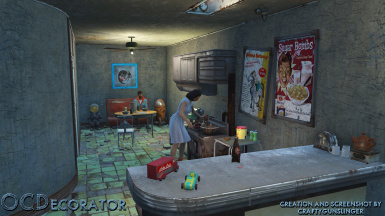 It will dispense them for you to move around in the normal settlement edit mode. It does have some negative side effects but the pros WAY out weight the cons. I will talk more about the know problems in the known issues area. You can now directly loot the objects you place with the dispenser. 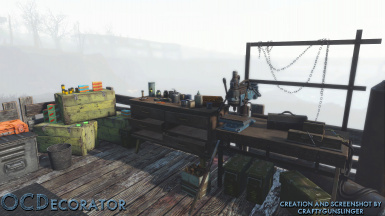 No need to enter crafting mode to scrap and then loot from the workbench inventory. The Installer should do most of the work for you but I do recommend that you uninstall previous versions of OCDecorator first. I am including patch notes to tell you what's changed (which will be more detailed in the future). The latest updates are more for new users so they have easy install options, and to incorporate various fixed from other authors in the community. 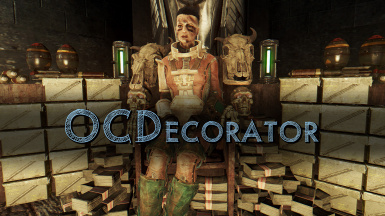 If you are an Obsessive Compulsive Decorator, you can now safely spend hours fine-tuning the placement items without worry. 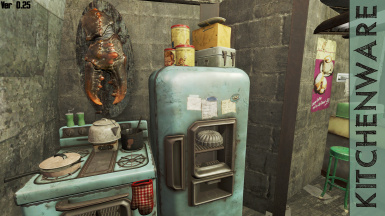 No more concerns about Dogmeat passing gas and knocking over a drinking glass on the other side of the settlement.. 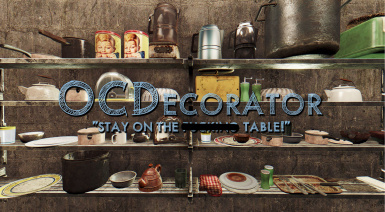 This mod makes inventory items into decorative static objects. Objects CANNOT be knocked over. Not by you, the settlers or a bizarre unknown force. Objects CAN be moved around. 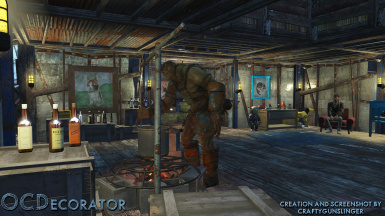 Use the crafting menu, like any other settlement object. 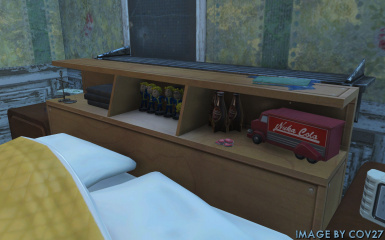 Objects CAN be scrapped and it returns the item back to the workshop inventory. You can transfer it back to your inventory from there. ANY object you pick up can be placed with the OCDispenser tool! I'm including custom stuff from other mods in that statement. Objects build with OCDispenser CAN be picked up and put directly into your inventory. OCDispenser: Legendary/Custom weapons and armor are turned vanilla, permanently. This is just how the script and game handles custom items. There might be a possible fix in the future. There are plenty of warnings to prevent you from losing these items. OCDispenser: Weapons snap at the grip. This is just how the script and game handles where the item should connect to another object in the game. In the future I will make consider making custom versions, that you can build in the OCDuplicator for better placement. 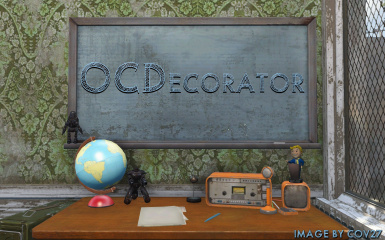 SHELVES - This is not a problem with OCDecorator but the vanilla Fallout 4 shelves. I suggest you look at the DIY shelf clutter mod linked in the recommended sections. If anyone is good at making custom collision maps/models, I would love help with this. 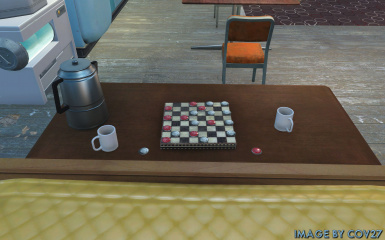 Some Glass Objects Missing Textures - This is not a problem with OCDecorator. 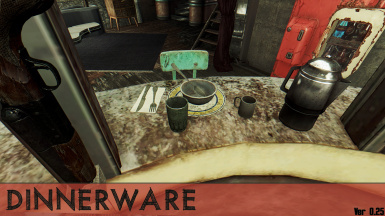 It's an issue with the textures that Bethesda used. I'll need to replace them to fix. If anyone is good at doing this, I would love some help. 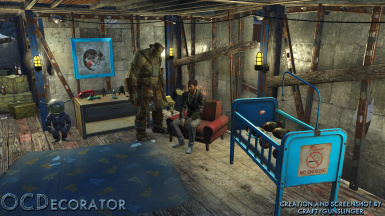 When fallout4 was first released, Bethesda was not expecting people to care much about settlement building, so they shipped the game with a way to small limit. With the release of the Far Harbor DLC, they showed that they had learned form their mistake and patched this problem, increasing the FormID limit from a few hundred to over 60 thousand. 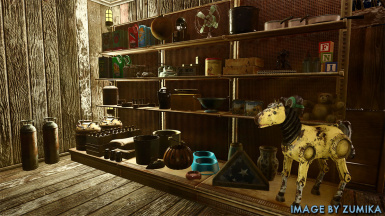 This means that settlement builders can continue to wantonly expand the variety and number of items in the game without resorting to Settlement Keywords as an architecture. 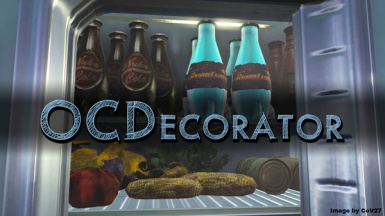 I could recommend many different mods but these mesh with OCDecorator very well. • Place Everywhere - I cannot recommend this enough for OCDecorator users! CORNDOG - The man behind the script. OCDecorator 1.05 wouldn't be possible with his work! I'm sure I forgot a dozen people. I ❤ you all!